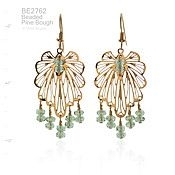 You're sure to turn heads with our beautiful, Beaded Pine Bough earrings! Featuring pale blue-green fire-polished glass beads, this festive design is a joy to wear anytime! Photographed here in 14k gold-plate with 14k goldfill earwires, these earrings are also available in a rhodium (silver) finish with sterling silver earwires.